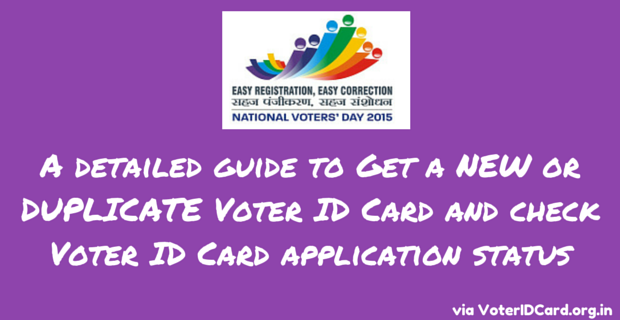 How to Get New Voter ID Card in Delhi? How to make voter id offline for south west delhi? I want to apply my adhaar card how to apply. ? I have not yet applied for voter’s id card due to some reason. I would like to vote on 4th december, 2013 i.e. on election day. Please tell me that if i go on that day with my required details on the polling booth where my parent’s would be going, will i be able to vote? my voter id n0. 21915633, submitted in on line,pl. send my voter card. Hi Applied for Voter ID few months back but i didn’t get my voter id, when i am checking on CEO Delhi it shows it has been approved and when i check my name is electoral list, i found it..but i didn’t get my Voter ID Card yet… Please advise if anyone can help. I have applied for registration and issue of Voter Id Card for my son in December,2011 with required documents at VREC , AC 36 ( BIJWASAN ) . My son’s name was reflected in Electoral Roll in 2012 M.C.D. Elections , at Serial No. ; 1222 of Polling Station No. ; 48 . Despite of several visits to the VREC by me and my son we and VREC staff didn’t find the Voter Id Card of my son and he could not vote . Later in your BLO camp held at M.C.D. Primary School , Raj Nagar – II in Nov. 2012 , I was told to submit fresh form with relevant documents and the same were submitted by me on 12/11/2012 . But all in vain . Till date I am waiting for his Voter Id Card . So Please tell me what to do next for getting his Voter Id Card at the earliest . I HAD APPLIED FOR NEW VOTER CARD . pls information. Please use your RTI rites to know why card is not with you in time and who is faulty. This is only the way it will work !! so where to collect my voter card from …. application ID is 2418090 05-02-2013 3.38 P.M not response Please Make and Inform us. I want to know that i have applied online for voter id card in south-west delhi, but after searching the reviews i got the negative response means BLO Booth Level Officers they come after 5 or 6 months later, then they take required documents from a candidate. Thereafter, they also take more month… what is the law of making voter-card id. I don’t know what’s the process but whatever i heard and saw the reviews of candidate’s I feel personally I was wrong to apply online for voter-id card… So, here I want to know that can i apply again for voter id card even i have already applied, because I am not sure The BLO Booth Level Officers will come or not….and If they come so they will send my voter id card on time or not? so I am confused about this….and I need voter id card immediately….so anyone can reply me regarding this question should I apply again or not? I have been settled in Delhi after my retirement from Central Reserve Police Force. and presently residing at Plot No. 23 opposite Goyala Khurd Sr. Secondary School Shyam Vihar Phase-II Nazafgarh New Delhi. I have no voter ID since my birth . I would request to your good self to enroll my name on line for issue of Vodter ID Card. I have changed my address and I need that to be endorsed in my Voter I Card with no DKN2541209 which was given to me on 2.09.2000. Incidentally my consitutency has also changed and I need to know the status of my card and my name in the voter list. Due to this problem I was unable to cast my vote in the last Loksabha and Bidhansabha election. Soilcit your kind guidance and need advise in this regard. The EPIC or Voter Identity Card for all the first time applicants whose applications have been accepted shall be handed over on National Voter’s Day to be celebrated on 25th January 2013. All such applicants shall be invited for this occasion. All other applicants shall get their Voter Identity Card by Speed Post after 15th January 2013. I HAD APPLIED FOR NEW VOTER CARD ITS GOIN TO BE AROUND 2 YEARS, ENQUIRY OFFICER CAME TO MY PLACE AND TOOK ALL REQUIRED DOCUMENTS ADDRESS PROOF ALONG WITH MY EDUCATIONAL CERTIFICATE’S PHOTO COPY. BUT TILL NOW I HAVE NOT RECEIVED ANY CARD AND NOT ANY INFORMATION AVAILABLE FOR THE SAME. i had applied for a new card on 15/03/2013 recd. by your office on 10/04/2013, as i am now 18 years old, in spite of my father visiting your office near Karkardoma courts, east delhi many times he could not get the card. Today he was told that in spite of the fact that my card was ready it could not be given to him even though he went there to collect along with my adhar card and his voter ID card & adhar card. why is this and why should i and my father be harassed like this, why have i not been called with time and date so that i could appear if it is so required. i have applied for my voter-id card 5 months ago online.. but required documents were taken away by their own man.. guide me with the process now what to do with it.. still waiting for voter id card… urgent need of it..